On my first day in my job in a small consulting firm, I was staffed on a short project for three days. There were many folders on the network drive and each folder had hundreds of files in it. Select the file and copy its name. Paste that name in a cell in Excel and hit Enter. Move to the next file and repeat step 1 & 2. It was – Simple and a huge waste of time. What took me three days could have been done in a few minutes if I knew the right techniques. In this tutorial, I will show you different ways to make this entire process super fast and super easy (with and without VBA). Heard of FILES function before? Don’t worry if you haven’t. It is from the childhood days of Excel spreadsheets (a version 4 formula). While this formula does not work in the worksheet cells, it still works in named ranges. We will use this fact to get the list of file names from a specified folder. Now, suppose you have a folder with the name – ‘Test Folder‘ on the desktop, and you want to get a list of file names for all the files in this folder. In the folder from which you want to get the file names, either create a new Excel Workbook or open an existing workbook in the folder and use the below formula in any cell. This formula will give you the folder address and adds an asterisks sign (*) at the end. Now you can copy paste (paste as value) this address in any cell (A1 in this example) in the workbook in which you want the file names. Go to the ‘Formulas’ tab and click on the ‘Define Name’ option. 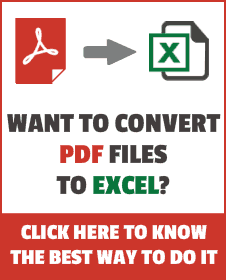 Want to Extract Files with a Specific Extension?? FILES formula retrieves the names of all the files of the specified extension in the specified folder. In the INDEX formula, we have given the file names as the array and we return the 1st, 2nd, 3rd file names and so on using the ROW function. Note that I have used ROW()-2, as we started from the third row onwards. So ROW()-2 would be 1 for the first instance, 2 for the second instance when the row number is 4, and so on and so forth. Now, I must say that the above method is a bit complex (with a number of steps). It’s, however, a lot better than doing this manually. But if you’re comfortable with using VBA (or if you’re good at following exact steps that I am going to list below), you can create a custom function (UDF) that can easily get you the names of all the files. The benefit of using a User Defined Function (UDF) is that you can save the function in a personal macro workbook and reuse it easily without repeating the steps again and again. You can also create an add-in and share this function with others. Now let me first give you the VBA code that will create a function to get the list of all the file names from a folder in Excel. The above code will create a function GetFileNames that can be used in the worksheets (just like regular functions). Follow the steps below to copy this code in the VB Editor. Click on the Visual Basic button. This will open the VB Editor. In the VB Editor, right-click on any of the objects of the workbook you’re working in, go to Insert and click on Module. If you don’t see the Project Explorer, use the keyboard shortcut Control + R (hold the control key and press the ‘R’ key). Double click on the Module object and copy and paste the above code into the module code window. In any cell, enter the folder address of the folder from which you want to list the file names. Copy and paste the formula in the cells below to get a list of all the files. In the above formula, we have used ROW()-2 and we started from the third row onwards. This made sure that as I copy the formula in the cells below, it will get incremented by 1. In case you’re entering the formula in the first row of a column, you can simply use ROW(). The GetFileNames formula returns an array that holds the names of all the files in the folder. 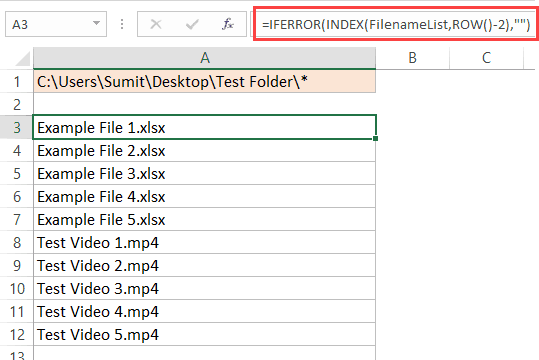 The INDEX function is used to list one file name per cell, starting from the first one. IFERROR function is used to return blank instead of the #REF! error which is shown when a formula is copied in a cell but there are no more file names to list. The above formula works great when you want to get a list of all the file names from a folder in Excel. But what if you want to get the names of only the video files, or only the Excel files, or only the file names that contain a specific keyword. In that case, you can use a slightly different function. Below is the code that will allow you get all the file names with a specific keyword in it (or of a specific extension). The above code will create a function ‘GetFileNamesbyExt‘ that can be used in the worksheets (just like regular functions). This function takes two arguments – the folder location and the extension keyword. It returns an array of file names that match the given extension. If no extension or keyword is specified, it will return all the file names in the specified folder. 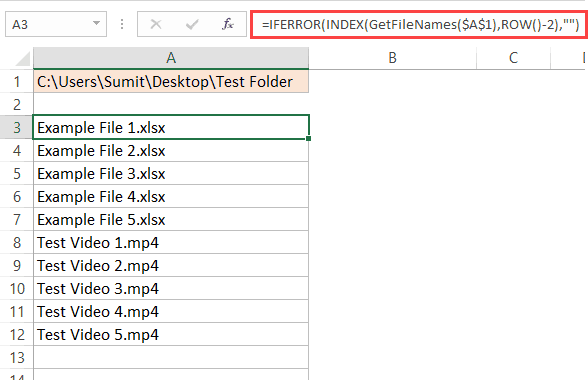 In any cell, enter the folder address of the folder from which you want to list the file names. I have entered this in cell A1. In a cell, enter the extension (or the keyword), for which you want all the file names. I have entered this in cell B1. How about you? Any Excel tricks that you use to make life easy. I would love to learn from you. Share it in the comment section! Filter cells with bold font format. How to Combine Multiple Excel Files into One Excel Workbook. 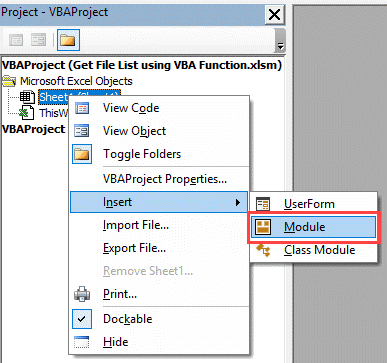 Using VBA FileSystemObject (FSO) in Excel. Please help for the Macro Code for the same. I see the method for only listing specific extensions but is there a way to exclude extensions? Thanks a lot for your tip. it’s helped me a lot.. 🙂 .. Thanks for the tip – worked like a charm! I knew of to do it with marco but with a simple formula! wonderful! For A, the idea is I have a PDF file, let say rev. 1,2,3,4 etc, and I will put it in one folder, what I need is I need to capture the latest revision with hyperlink using formula. For B, the idea is almost same as above except for one revision, let say rev. 01 and I will put it in one folder (same folder as formula A), what I need is I need to capture the exact revision with hyperlink using formula. I get this this formula but i don’t know how it will work- thanks in advance. I only tried the first method and it works perfectly for me… thank you so much for saving me days of boring inputing!! 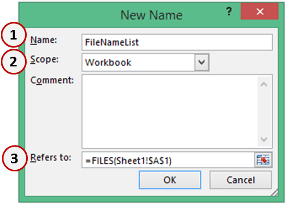 How to get the file name list in Date Modified order in this excel workbook ?? Remove the first “/” (the one before Volumes) and change the rest of the slashes to colons. The code only pulls the first file for each sample and fails to list the second (or third file). Is there a way to correct for this? Thanks. I have a ecxel sheet which have some product names, and also have a folder which have some pdf files named same as in cell data, like if cell A2 value is apple1, Pdf file name is apple1.pdf, i want to know which name file is missing, can we get that in excel somwhow.. I want to list the names and duration of all videos in a folder and its subfolders using Excel VBA. From the code below I can get the duration of video files, but I can’t exclude all other files. This gives me a list of all the file names, which I don’t need. Also I am failing to loop through subfolders. What I want to achieve is for the macro to loop through all subfolders in the the given root folder and list only video names and duration in columns A and B. Some help with this is truly appreciated. Wow! That’s ingenious and too much for free 😀 May Allah bless you brother. Thanks a lot. Hey! Sumit Bansal right? As a matter of fact you are my excel HERO. I’ve been following your blog for quite a while now and everything you thought was amazing. Even though I’m still a student, I know one day this knowledge is going to save me a lot of time. I thought I was an excel expert with my one semester training So I created a blog to publish my skills on (http://excel-programming.com). But upon discovering your skills and experience I think I still have a a long way to go. Thank you very much for this blog. You are doing wonderful work Sumit to educate Excel users. God bless you. Please try the Excel Addin called ASAP Utilities by downloading it. There is a free (Home&Student) and paid version. File listing in Excel sheet of any directory and nested sub directories, with many properties of the files is so easy with many menu driven options (Menu-File & System-Item 24) This is just one of more than 300 utilities. It will be very useful for all Excel users and saves tons of time and effort. Current version is 7.4 and the link to the site is http://www.asap-utilities.com/ . I do not have any pesronel intrest in the product except to make it known to many Excel users to benifit in their work. It was developed by Bastien Mensink from Netherlands way back in 1999. I am using it since that time. Feed back on your experience is appreciated. Sumit this one deserves a kudos!! Some time back i was working on its VBA and m non VBA guy………. Hmm, nowadays I would go with a Power Query ( Get and Transform) solution. Read from folder, and delete all columns except file name. Save and load to table. No macro, no formula involved. Thank you for this repost. Is there a way to list folders in a directory? Since it has not been corrected I assume that it has not been reported yet. The first version of this formula: =IFERROR(INDEX(FileNameList,ROW()-2,””) should actually be: =IFERROR(INDEX(FileNameList,ROW()-2),””). The trick won’t work until the right formula is used. Thanks for pointing out Charles.. have corrected it! I copied everything exactly but my cells are blank in the B column and it doesn’t populate the file names. any reason why? Also I’m using office 2010. I figured out the issue, i didn’t have a slash before the asterisk * at the end. But I have one more question. Can this be used to get a value from a cell in these docs as well? e.g. I get a list of all docs in a given folder, can I then get a value from a cell in each of those docs if its all the same cell in each doc? Hi Sumit, great tutorial. I used this because files are constantly being added to a specific folder. This allows for the names of those new folders to show. Since I do not know the names of the new files that will be created I was hoping to then use the results of this in an external reference formula. Do you know if this is possible? for a more comfortable approach. One method I have used before uses the command prompt. Navigate to the folder you want to extract file names from. Type (dir /b > “sample.txt”) minus the parenthesis. This will create a text file in the same directory that you can then open in Excel for further processing. Amazing! Thanks for this Great Trick!!! Question: When the New File Names come in, they Start Over from the Top-Shifting File Names Down, how can I get them to come in at the bottom of the list (based on date/time modified)? Make File Name Hyperlink? If I Select the Column with your Formula, Insert Hyperlink and Add Folder Location, this links them to the folder, but how can I make it open the file directly? Also If you can Help: I have a Folder Filled with Email Messages (.msg Files) that I am keeping a Running List of in Excel and have to manually enter data from each Email such as Name (Email Address before @) + Company (Email Address after @), Date Received etc. – Is there a way to Auto Populate this information into Excel from the .msg File following the Automated File Name you have created here? I have a single folder with multiple sub-folders each with multiple files, can I extract at the highest folder level? Hi, Is there a way i can get the time the file is created in addition to the file name? Can you plz look at screenshot and give me some guide lines that where i do wrong? And my required folder is on Sharepoint. Amazingly quick response. I will re-check. Thank you. I tried Getting a List of File Names from a Folder in Excel. Why did I get #NAME? instead of the name of the first file? I like your video lesson. Thank you. Hello Husen.. Check the named range reference. It seems your named range is not referring to the cell that has the folder path. Sumit, is there a way for this formula to look within a series of sub-folders for the same results. It would automatically update if you open the workbook or you press F9 (to force a calculation), or even if you make any change in the worksheet. Hi. I have been here for more than an hour and for some reason I can’t get this to work. Know I’m going to love it and use it a lot, once I can get the first one working. Any chance you can take a look at mine and tell me what I’m doing wrong? I would so much appreciate it! Thanks so much for replying. And so quickly! Awesome. Unfortunately that didn’t work. It shouldn’t look something as shown in your spreadsheet. Also, make sure the excel file (in which you are extracting the file names) is saved in the same folder. At it again this am. Losing my mind. Want this so bad and I just can’t get it to work. Tried everything. Must be something really small and stupid hanging me up. Heading to work. Little bit OCD – lol. I will get back at it when I get home but not too optimistic. hi sumit! i followed the instructions but all i got was a blank cell.. The function of FILES does not exist in my version of excel 2010! May be it originated from some Add-Ins? Also, is there a way to get the list of all the folders,subfolders and filenames along with file size and modification date columns. Another way to get the directory. HI Sumit, thanks for the quick response. is there anyway you can help with that code? I have been trying to search for it online but nothing seems to pop up. Never seen this trick before. Great stuff. I was able to follow your instructions, but when i save it and go back it isnt there it just has name#. I am not familiar with Macros and it ask me to save Macros-Free and when I do my list isnt there. how can I save it. apologize in advance. Thanks for commenting.. Could you share the sample file you are using. Since FILES is an old formula it may have some limitations, need to check on it. Once I wanted to do the same so I wrote an Excel Add-in for doing that. It can get filenames, folders, file extensions and other information regarding files. This tool can write up to excel limit number of rows in just a few minutes. In a stress test I did, I got more than 1,000,000 file names in just about 3 minutes. Suppose i want to do same for folder name than how we can do? Hi, I am waiting for your revert. This was a great time saver Sumit, thanks. ? is there a way to make them a hyperlink without going through every single one? A formula that only works in named range?! !..this is great find. That is really useful, thanks very much! to get a sense of how far we need to go down. btw, another approach in getting the directory for consideration. Wow, this is great. Easier than the VBA code I wrote to do the same thing! thnx a lot for such a great trick. Is “Files” function is valid only Excel 2013. I am trying to make it in Excel 2010 but could not find the Turkish of “Files” in Excel? I am dying here to try above trick but still waiting your reply about the function FILES ? Hey.. this formula is valid for all versions of Excel. However, I could not find its equivalent for Turkish Excel. Since it’s an old function, even the help is not available for it now. I made it but unfortunately when I drag down, it gives only the first file name ? I think I got the issue.. Replace the function ROW with ROWS, and it should work for you. Hope this helps. Thnx a lot and sorry for wasting your time!